Fireproof Children and child development specialists developed the award-winning play safe! be safe! multi-media classroom kit for BIC Corporation. Fireproof Children developed and has provided the play safe! training workshops and order fulfillment for the play safe! kits for more than 20 years. Each year communities are selected to receive play safe! be safe! community fire safety workshops at no cost. 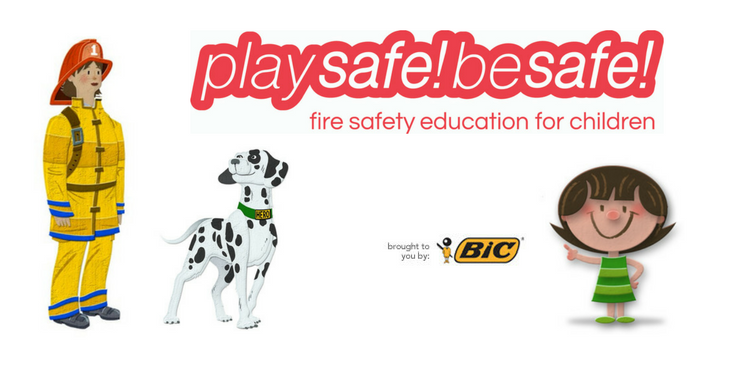 A grant to Fireproof Children, from BIC Corporation underwrites the cost of the presentation and provides a free play safe! be safe! kit to every participant. To provide as many preschool-age children and their families as possible with high quality, age appropriate fire safety materials and training, we target state and local community agencies in larger metropolitan areas providing early childhood education, day care services and community safety. Early childhood educators, day care providers, fire safety educators and other health, safety and education professionals. The vulnerability of young children to fire and burn injuries. The surprising frequency of children’s misuse of fire, their distorted perception of fire, and limited capacity to understand the potential danger of fire. Effective developmentally appropriate methods to teach fire prevention to young children. How to motivate children and families to change behaviors. How to involve parents in home fire safety. How to work with community fire service to promote fire education and prevention. More than 215 play safe! be safe! training workshops have been presented by Fireproof Children. The play safe! be safe! ® program was inducted into the National Fire Heritage Center in 2014, in recognition of 20 years of fire safety education for young children.